Recording Reviews: Uncommon Ground & En-Cor! For this week’s post I have two brief recording reviews. First up is a recent release on the MSR Classics label, Uncommon Ground: Contemporary Works for Trumpet with Horn, Trombone, Piano, and Organ. I was particularly interested in this album because three of the performers were classmates of mine at the University of Wisconsin-Madison: Amy Schendel, trumpet, Todd Schendel, trombone, and Bernhard Scully, horn. All three have gone on to distinguished careers as performers and educators, and I’m grateful to have had the opportunity to perform with them. 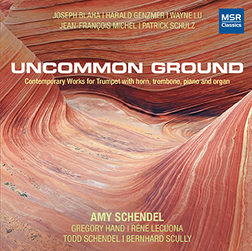 A majority of the tracks on Uncommon Ground are world premiere recordings, including two works for brass trio, Jean-François Michel’s Suite pour Trompette, Cor et Trombone (1994), and Joseph Blaha’s French Suite (2011). Both are very fine compositions, and highly recommended for those looking to expand their knowledge of the brass trio repertoire. For a little bit of background on the Michel, here’s a quote from my article on brass trio repertoire in the most recent issue of The Horn Call. Michel is a professor at the Haute Ecole de Musique in Fribourg, and is a prolific composer and arranger for brass. The first movement opens with extended solo fanfares for the horn and trombone, followed by a faster section full of syncopation and mixed meters. The lyrical second movement makes for a nice contrast with the faster, more energetic outer movements. This piece puts some new twists on a traditional form, with plenty of great writing for all three instruments. “Brass Trio Repertoire: Beyond Poulenc”, The Horn Call, May 2015. Joseph Blaha serves on the faculty at Roanoke College, and his French Suite was commissioned by the Contrapunctus Brass Trio (Amy Schendel, Todd Schendel, Bernhard Scully). I had the opportunity to hear these players in a live performance of the piece at the 44th International Horn Symposium in Denton, TX, and was very impressed. Modeled after the French Suites of J.S. Bach, Blaha’s trio makes frequent use of counterpoint, with plenty of interesting lines for all three instruments. The playing on this album is of the highest caliber, as one would expect, and I was especially impressed by the clear, focused sound and impeccable intonation throughout. All three players are comfortable with the entire range of their instruments, and are able to produce, in my opinion, exactly the “right” sounds required by the music. The second and final review for today is En-Cor!, featuring the American Horn Quartet. Financed primarily through a Kickstarter campaign, En-Cor! is likely the final recording by one of the most decorated brass ensembles in the world. After nearly 30 years of concerts, competitions, master classes, and residencies, the AHQ will be collectively retiring in 2015. (For much more information on the history of the AHQ, see Kerry Turner’s article in the May 2015 issue of The Horn Call). Though the ensemble has recorded most of the major works for horn quartet, including group member Kerry Turner’s own fine compositions, the CD booklet notes that there were many other lighter works in their repertoire that had not yet been recorded. Over the years, these brief compositions became audience favorites, and were often used as encores at AHQ concerts. Thus, En-Cor! is in many ways a retrospective of some of the quartet’s finest playing, spanning everything from Bach to Bernstein. As for their performances, I can’t really say much that hasn’t already been said. If you’re a horn player, chances are you’ve heard of the American Horn Quartet, and if not, buy this album – or any of their albums – today. You will hear playing that pushes the boundaries of what’s possible on the instrument, all the while with warmth and expressiveness to rival any other chamber group out there…period. Their many fine recordings, including this one, which have left such an incredible impression on generations of horn players. The handful of other professional horn quartets currently performing, many of them modeled after the AHQ’s example. To paraphrase the closing of Kerry Turner’s article in The Horn Call, when the AHQ began 30 years ago, a horn quartet was considered more of a novelty than anything resembling a legitimate chamber ensemble. Today, there are many other brass chamber groups (not just horn quartets) who have benefited from the AHQ’s groundbreaking career. And while the reviews, recognition, and awards the AHQ has garnered over a nearly 30-year period would be considered remarkable in any field, their true legacy is the legions of horn players they have influenced and inspired.